When it comes to breathtaking views, beautiful mountains, and year-round outdoor activities, the Rocky Mountains are home to some of the country's best national and state parks, including Glacier National Park in northwestern Montana between St. Mary and Whitefish. The best time of year to visit Glacier National Park is during the warm summer months of July, August, and September. June and October are also lovely times to go, but the higher elevations of the Going-to-the-Sun Road, including Logan Pass, may be blocked by snow. However, If you love cross-country skiing and snowshoeing, winter is a better time to visit Glacier National Park. Spring, on the other hand, can be cold and wet and isn't a great time to explore the park. Whether you enjoy outdoor activities like hiking, backpacking, and cross-country skiing or would just like to take a scenic detour on your cross-country vacation, this National Park makes for the perfect pit stop on your trip. 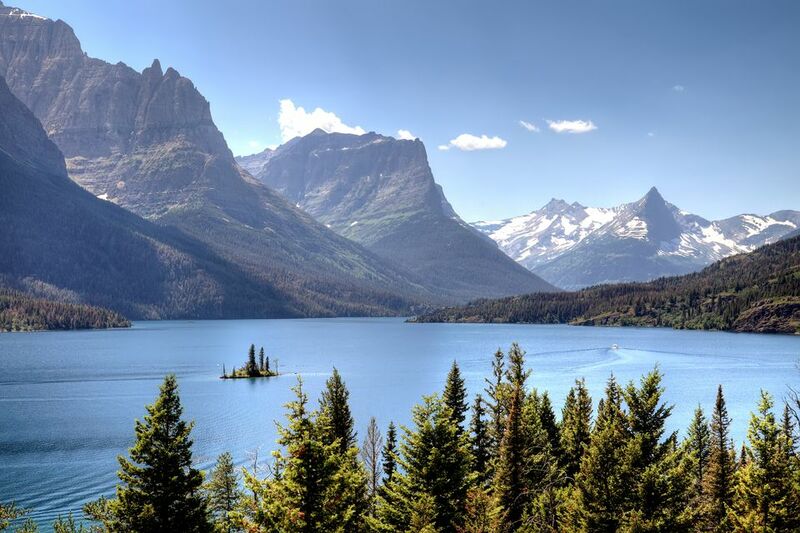 Getting to Glacier National Park is a three-hour drive from Missoula, in the northwest corner of Montana, and as a result, you'll likely need to spend the night nearby if you plan to enjoy any of the outdoor activities during the daylight hours. If you're visiting during the warmer summer months, you can always camp within the park itself, but there are also a number of lodges and cabins in Glacier National Park where you can stay indoors as well. Unfortunately, most of these don't have access to air conditioning, internet connection, or many dining options. If you want more comfortable accommodations, you'll have to head to Whitefish or Kalispell, which both have hotels and lodging near Glacier National Park. When it comes to things to do in Glacier National Park, the activities and events largely depend on the time of year you're visiting. No matter what time you visit, Glacier National Park is all about the scenery. Called "The Crown of the Continent" and "The Backbone of the World," the sharp peaks and steep valleys in this section of Montana combine with clear waters and wildflower-filled meadows to yield spectacular views. During your time in the park, you can experience this unbelievable scenery on a scenic drive, a day hike, from a horse's back, on a boat tour, on a bike, or while floating the Flathead River. Other activities include hiking and backpacking, watching wild animals, guided tours, ranger-led programs, camping, photography, biking, fishing, boating, cross-country skiing and snowshoeing, and a variety of special events. Many people who drive across or hike through Glacier National Park enjoy looking for wildlife along the roads and trails. There are even ranger-led programs offered by the National Parks Service that help guests identify the different species of flora and fauna that call the Rocky Mountains home. The large animals are dangerous and should be enjoyed from a distance, so be sure to review the NPS' bear safety guidelines before you go. Smaller animals such as chipmunks, marmots, and Clark's nutcrackers can be quite amusing and enjoyed up close. Grizzly bears, black bears, bighorn sheep and mountain goats, gray wolves, elk, cougars, bats, shrews, skunks, badgers, river otters, beavers, marmots, chipmunks, ladybird beetles, harlequin ducks, ptarmigans, and C lark's nutcrackers are all among the creatures you might encounter on your trip through the park. Driving the Going-to-the-Sun Road can be nerve-wracking for several reasons, but mainly because it's a narrow, two-lane road with steep drop-offs. Also, traffic often backs up for summer road construction or wildlife, making progress across the park slow, and parking at turnouts and visitor centers is limited. As a result, Glacier National Park offers free shuttle service along the Going-to-the-Sun Road to cut down on traffic. Because of its remote and mountainous nature, there is very limited cell phone and WiFi access in the park, so be sure to plan accordingly by knowing directions before you travel as you likely won't be able to check Google Maps while you're on the trail. Dogs are not permitted on hiking trails or in any of the park lodges and facilities. Dogs on a leash are permitted in your vehicle, the parking lots, and at campgrounds. Glacier National Park is located in the northwest part of the state of Montana, between West Glacier and St. Mary. While it may be a little out of the way on a cross-country trip, there are several ways to access this Rocky Mountain park. There's even an airport nearby named after the park; the Glacier Park International Airport is located in Kalispell, Montana, approximately 30 miles from the western entrance to the park. The charming mountain town of Whitefish is nearby, and you can either rent a car or take a shuttle from the airport to access it. If you'd rather travel by train, the ​Amtrak Empire Builder rail route stops right in Glacier National Park at West Glacier, Essex, and East Glacier. Nearby stops are Whitefish, to the west, and Browning, in the east. If you are driving, the primary freeways to Glacier National Park are Interstate 90 from the east and west and Interstate 15 from the north and south. US Highway 2 runs along the southern border of the park with access to the West Glacier, Walton, and East Glacier entrances. US Highway 89 reaches the Many Glacier, St. Mary, and Two Medicine entrances on the east side of the park.